This is the ideal stroller for holidays due to its light weight and easy fold. The Joie Pact even comes with its own travel bag! Even if you are not going on holiday it is great for using on public transport as it only weighs a super light 6kg! It also has a strap enabling you to carry it for shorter distances if you don't want to put it in the bag. Suitable for use from birth as it has a lie flat recline so it has great longevity, and even better than that you can fold it with just one hand! 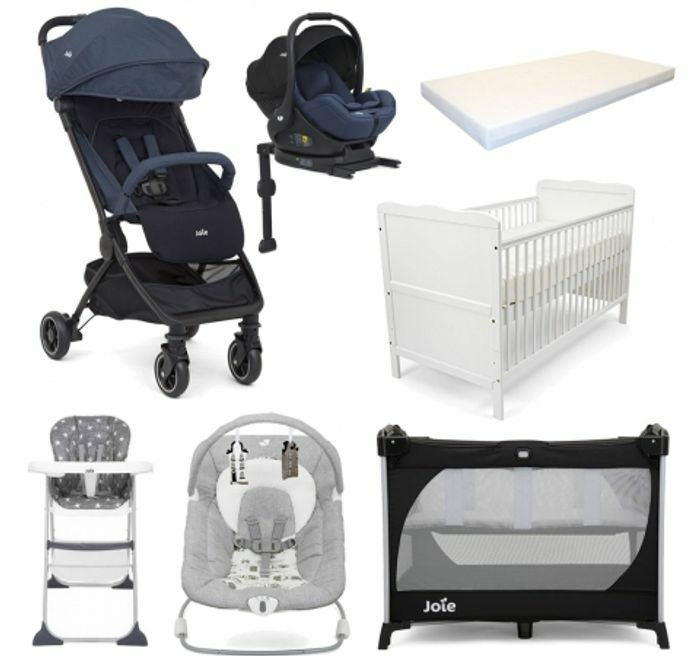 It also has the capability of adding a car seat with the included adapters - you can use any Joie infant carrier or any carrier that uses the Maxi-Cosi style attachment. Meeting the new I-Size ECE R129/00 standard the i-Level car seat will protect your precious little one from birth to 13kg. A lie ﬂat lounger when strolling this car seat cleverly converts in an instant from infant car seat to cuddly carrycot. Keeping baby cosy, the infant carrier reclines to a 157° angle giving the best possible position. The ISOFIX base included simply connects to the cars ISOFIX connectors and allows for a simpler installation by simply clicking the car seat in place on the base. Featuring a Tri-Protect headrest with patented Intelli-Fit foam provides side impact certified protection – along with all the latest and greatest safety features. Compatible with Joie Mytrax, Chrome, and Litetrax 4 pushchairs, and with other pushchairs using Maxi-Cosi car seat adapters it can be easily converted in to a handy travel system when out on the go. Meet allura. A convenient tag-along designed and engineered for secure sleep and play. Everything you need for effortless travel including a compact fold and convenient carry bag. Hand travel mate – ready to travel in an instant with all the essential baby needs for sleep and play. Its an easy carry along as its quick and easy to pop up and down in seconds. Built to last – with 100% premium, highest quality materials. Extra secure double safety latch system. Bassinet included, removes and attaches easily. Folds for storage - folded size L79, W25, D25cm. Meet Wish, the bouncer that comforts your baby from the moment they are born. The compact, light frame allows you to take it everywhere with you whilst you are out visiting friends and family with your precious bundle, meaning your newborn is always comfortable.Bounces with a gentle push or with babies movements the 3 position recline adjustments ensures your precious little one is comfortable and cosy at all times. Meetmimzysnacker. A tasty treat designed and engineered as a lightweight and convenient table buddy. With a fast, compact fold and simple, no-fuss features, dining out or heading to grandma’s never looked so easy. What do you think of this Kiddies Kingdom deal? It might look expensive at a first glance, but it's a great bundle. Thanks for sharing! Wow can’t believe how many items you get and a good make very good value for money. The pushchair is £150 and the car seat and base £200 at most places so if you say £150 for cot and mattress that means high chair, bouncer chair and travel cot are free.